A dream home set high above the valleys and the sea! Like an eagle's nest, this stone cottage is set in an elevated position above the mountain village of Pantasina, in the hinterland of Imperia. Every detail has been cared of. Highly restored and equipped, it offers every modern comfort in an absolutely quiet, natural environment. Three sunny terraces convince with breathtaking panoramic views over hills and valleys, up to the Maritime Alps and down to the sea! Modern technology and devices: underfloor heating, vent fireplace, solar panels etc. The stone cottage is detached on three sides and offers a living space of approx. 95 sqm gross / 80 sqm net on two levels. Since it was built on the hillside, there are several entrances. The main entrance on the upper floor leads into the hallway and from here into a bright, large open plan living/dining room/kitchen with fireplace. The kitchen area is equipped with a new fitted kitchen from “Miele” of high quality: such as the freezer, a steamer and a Japanese Tepan cooking island. Large French doors lead from the living room to a large panoramic terrace, a wonderful outdoor dining place. 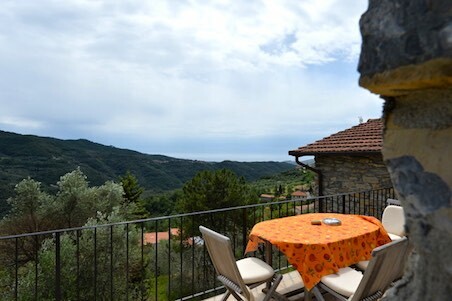 From here, a spiral staircase winds up to a roof terrace with breathtaking views of evergreen hills with olive groves, the Maritime Alps in the background, across the valley and down to the Mediterranean! On the same floor, there is a bedroom with a gallery (suitable as an additional sleeping area or an office) and a spacious bathroom with window and shower. 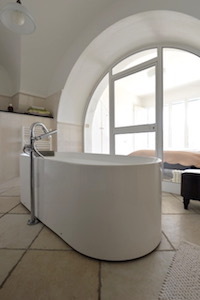 On the lower floor, there is the master bedroom with its beautiful vaulted ceilings and an en-suite bathroom with glass front, equipped with a freestanding designer bathtub. Large French doors lead out onto a partially covered terrace and into the garden. A garage of about 16 sqm with adjoining utility room right next to the main entrance, is currently used as a workshop. The terraced, Mediterranean garden of about 300 sqm with well-kept natural stone walls and a paved path, surrounds the house on two sides. On request, an adjacent plot of approx. 300 sqm with 15 olive trees is available to be purchased to produce your own olive oil and eventually to build a pool. The cottage is located in a panoramic position above Pantasina and is directly accessible via a narrow road only with a small car. Parking spaces for bigger cars are only about 2 minutes away. Surrounded by evergreen olive groves, Pantasina is a quiet, picturesque village in the hinterland of Imperia with a grocery store, bar and bus stop. Pantasina, which belongs to the municipality of Vasia, is located about 17 km, less than 30 minutes from Imperia and the coast with its bustling beach life. Nice and Genoa airports are about 120 km away. Distances: 17 km from the beaches and the nearest town (Imperia).